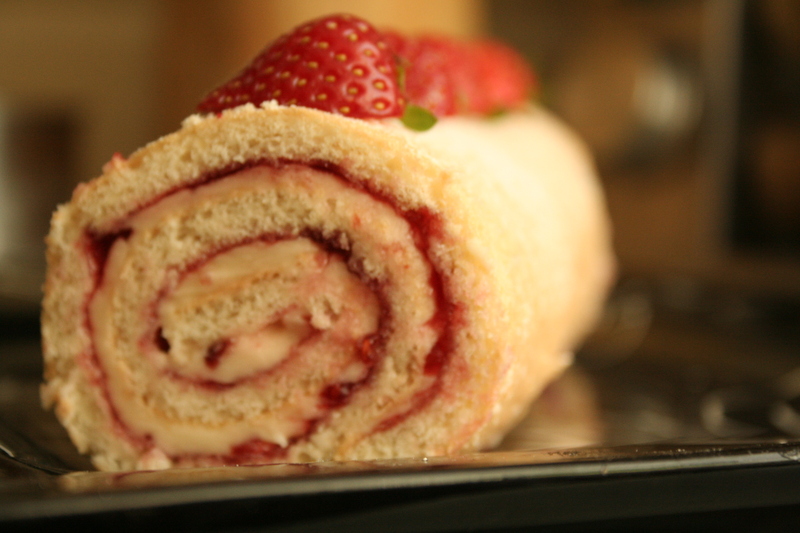 The term ‘roulade’ comes from the French word ‘rouler’ which literally means ‘roll’. 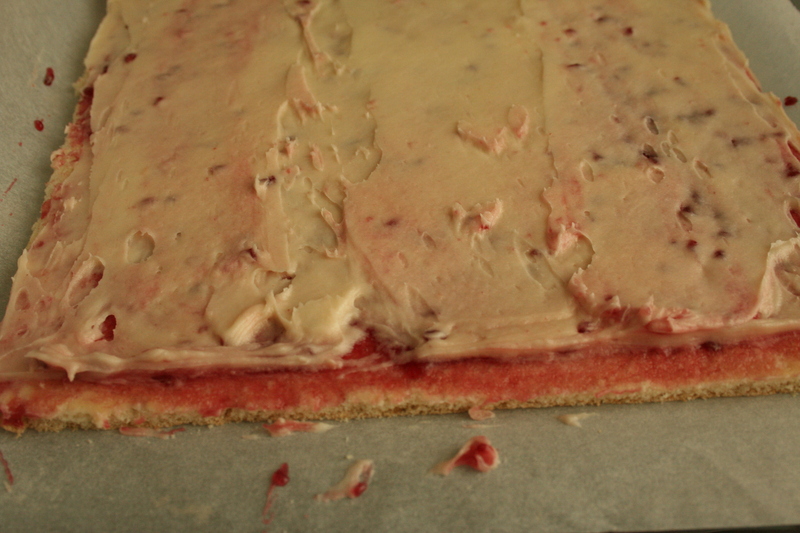 In patisserie, it is simply a sheet of cake rolled around jam, buttercream or other fillings. This really simple and easy cake has somehow gained a reputation as being ‘Not for Beginners!’. With this post, I am hoping to bust this myth and help you avoid the common mistakes responsible for it. 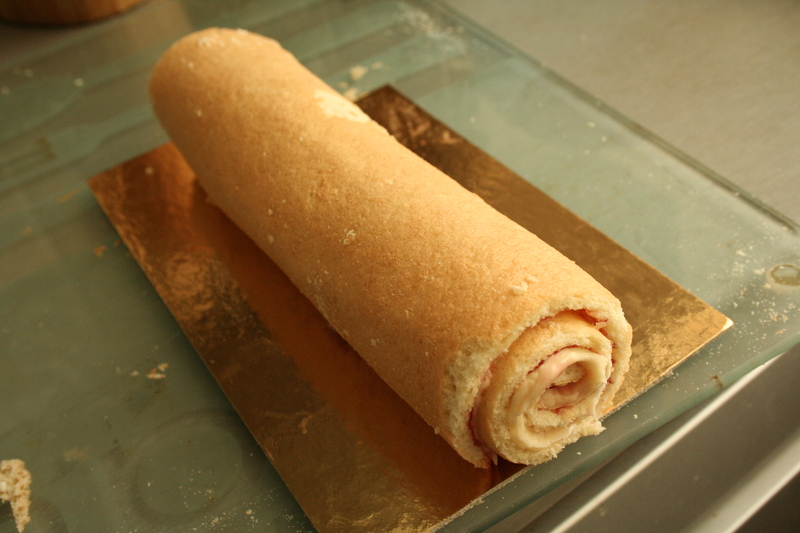 There are various recipes and techniques used to make the sponge for a roulade – French meringue, split egg, Genoise…. the list goes on. I tend to use the ‘Genoise‘ or egg foam method as this gives me a perfectly light textured flexible sponge. Remember to take the sponge out of the oven at the correct time and leave it to cool on the baking paper for 5 minutes. 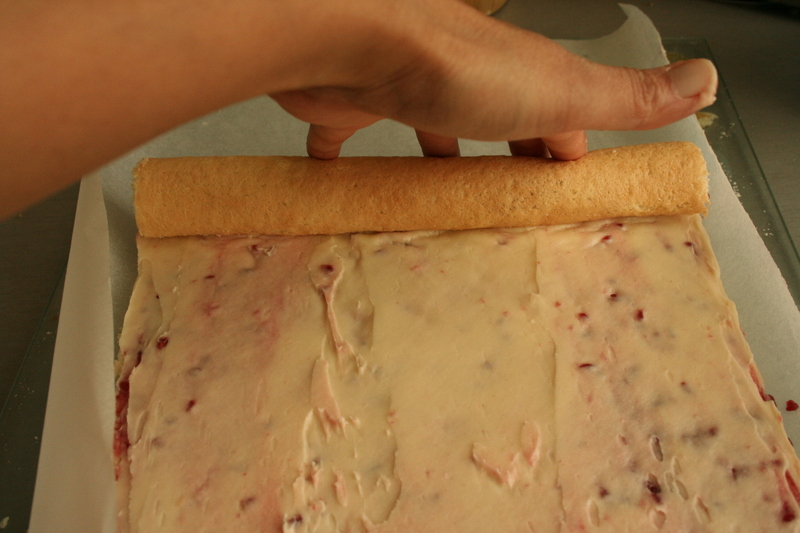 Then turn it over on a fresh baking sheet and peel off the one it was baked on. It should be cool enough to trim and roll in 10-15 minutes. Roll all the way to the end near you till it rests on its seam. 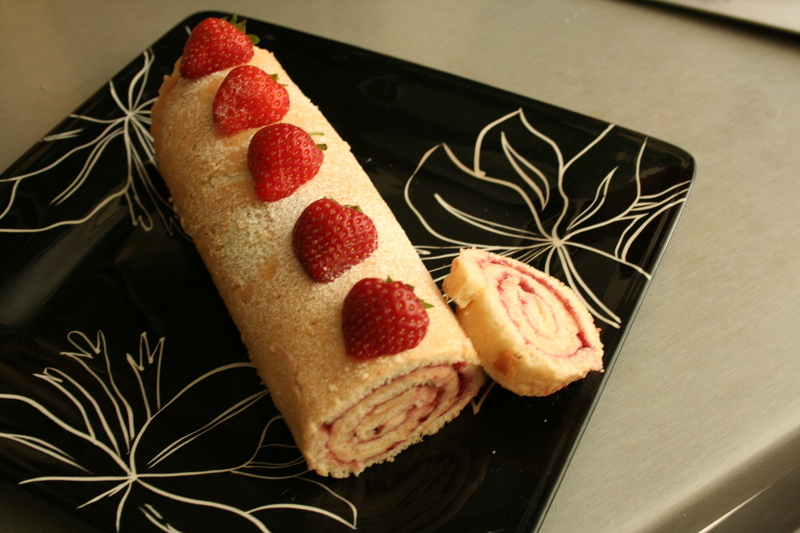 Place the roulade in the fridge to set. 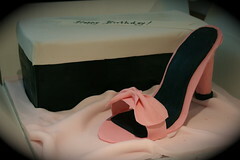 This helps it retain its shape and stops the icing/whipped cream from squishing out when it is cut. Garnish and enjoy with oodles of confidence and tea! 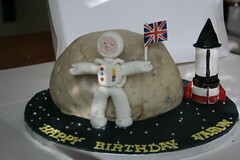 This entry was posted in Cake, Design and tagged Roulade. Bookmark the permalink. A thicker sponge should be ok as long as you don’t let it dry out too much..
Good luck with the rolling! I have read several good stuff here. Definitely price bookmarking for revisiting. I wonder how so much attempt you place to make one of these wonderful informative website. Yes, you could add melted chocolate or even cocoa powder for a chocolate roulade. Melted chocolate might make the mix lose a bit of volume though. If you use cocoa powder, adding in an egg yolk helps make it more moist. I have just made a chocolate roulade but the sponge mixture is too dry and it is far too cracked. It was in the oven for 20 mins exactly, which is what the recipe said. However, I did leave it in the pan to completely cool off?